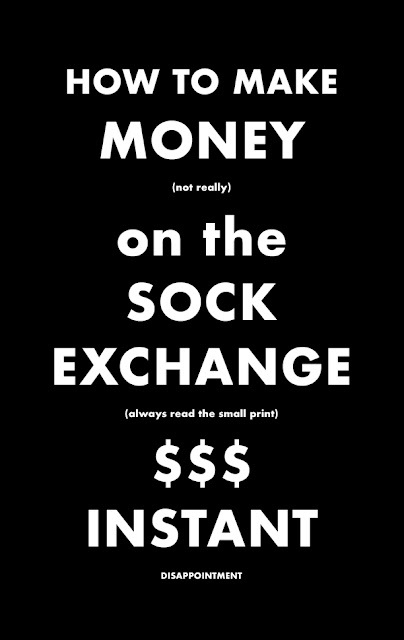 This is my guide to making money on the Sock Exchange. Warning: Socks may go up or down, or you may lose your socks completely. Do your research. It is no good buying socks willy nilly. You may have read about the sock exchange and thought that sounds like an easy way to make money, but believe me when I say it is no easy route to riches. Just ask Mrs Fishblanket. The first thing you need to do is buy some socks. the good thing about socks is that as well as being an investment you can wear them on your feet. Penny socks - a word of warning. People may tell you (Augustus Cheeselamp in particular may tell you - but more on him later) that this is the way to make your millions. But penny socks are penny socks for a reason. You will be very lucky if socks you bought for a penny ever increased in value. Don’t buy smelly socks. You will struggle to make any money on smelly socks. People generally avoid smelly socks, and if you wear smelly socks, people will avoid you, too. Don’t buy socks with holes in them, unless you are very good at darning. If you are very good at darning (and I mean very good) you may be able to make a modest return on your investment. Do buy stripey socks. Everyone likes stripey socks. Do buy socks when they are cheap and sell them when they are expensive. Don’t listen to Augustus Cheeselamp. He will tell you to buy his socks (without telling you he has a sock factory at the bottom of his garden). The socks he will sell you will be shoddy and smell of cabbages. Do buy my ebook, “How To Make Money On The Sock Exchange Without Leaving The Comfort Of Your Bathtub”, only $249, or buy my ten week ecourse, “How To Make Money On The Sock Exchange Without Leaving The Comfort Of Your Bathtub”, only $999.42. There, I think I have covered everything you need to make money on the sock exchange. You will soon be a millionaire, and all thanks to me. or a 10" x 8" paperback. What kind of cakes does Jake bake? And pumpkin cakes for witches and their cats. And fish cakes for fishes in the sea . . .
DON'T FORGET PIDDLES! One of my favorite Books by Otto Fishblanket! The inspiring tale of an incontinent penguin, and how he found fame and success against all odds. Doctor Kangaroo is now available in paperback! Hoorah! Hooray! 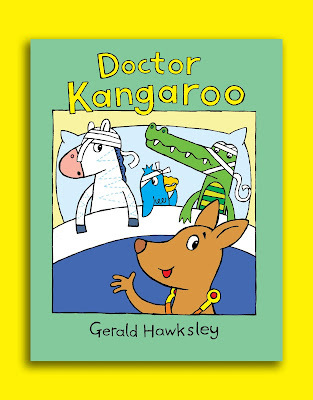 Doctor Kangaroo is available in paperback today! Get it HERE ! Zebra's got a cough! All his stripes have fallen off! What are we going to do? Call for Doctor Kangaroo!